Tired of your dated kitchen? Or maybe you’re just looking to breathe new life into a kitchen that you’re no longer so fond of? Undertaking a kitchen revamp doesn’t have to be extreme, or expensive. With a few key items and a lick of paint, you can turn the room around! A much cheaper alternative to replacing all your kitchen units. 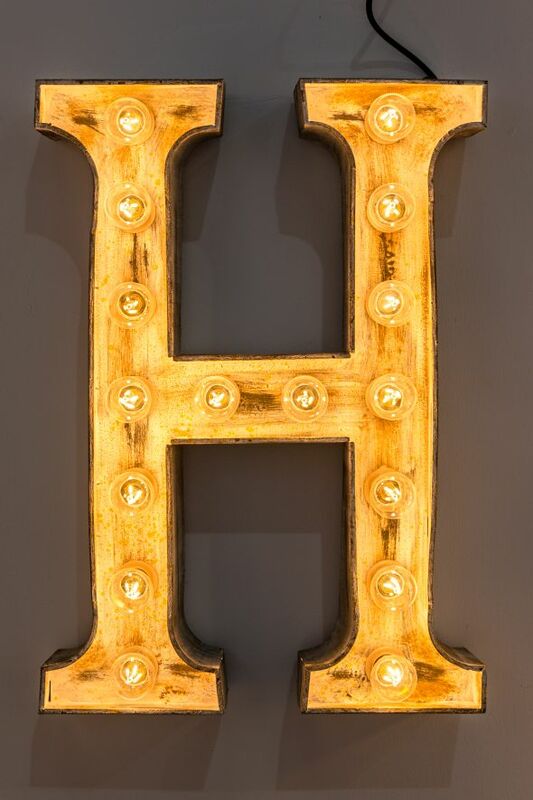 Choosing a light colour can brighten up a room and help it appear larger. Another option would be to remove the cupboard doors. We know this sounds crazy, but this open-plan style shows off your kitchenware and makes for a less confined space! One piece of furniture can make all the difference to a room, whether it’s the dining table, chairs or an interesting ornament. Choose this component first, then paint and accessorise around it. We love our customisable metal top dining table. 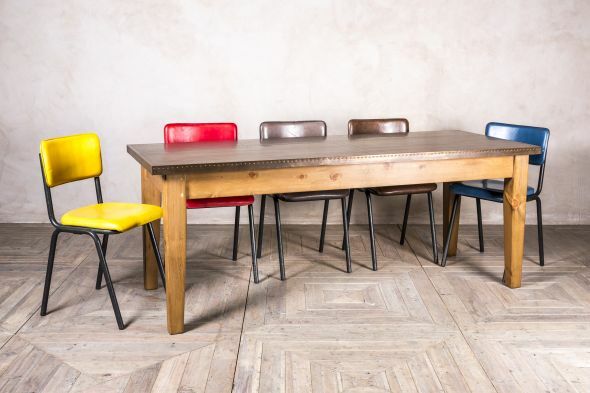 You have the choice of a brass, zinc or copper table top, and you can even choose the colour of the pine base and legs! We can paint it any Farrow & Ball colour; why not have the table to match the walls? Coordinating cupboard and drawer handles to the table top will really tie everything together. It might sound like an odd suggestion, but sorting through old belongings will not only provide space for new purchases; you may find new uses for things long since forgotten about! That old china set that you’ve had for ages but never used? It could go perfectly in your refreshed kitchen. New blinds, curtains or even tea towels can make such a difference to your kitchen. If you’re keeping your kitchen neutral, these are great ways to add subtle pops of colour! Clash prints and patterns for a more eclectic look. Repainting and replacing furniture will have you most of the way there, but accessories are what will complete the look. 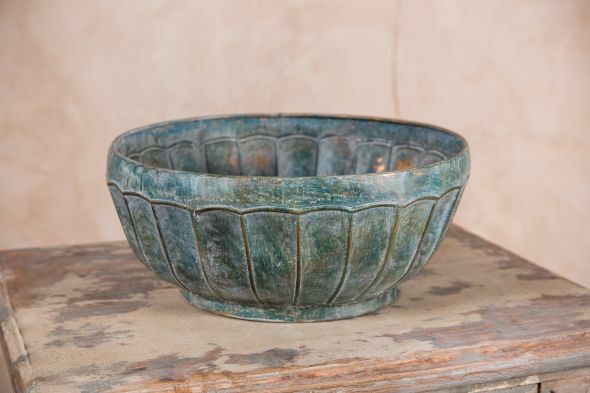 A decorative fruit bowl would make for an interesting focal point, or your initials on the wall can add that individual touch. Adhesive light strips can be fitted under units for an ultra-modern look. 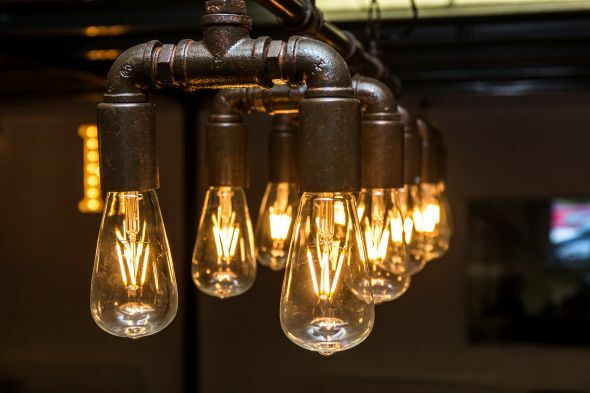 Conversely, vintage or industrial lights could be used to add character to the room. Pendant lights are very on-trend right now; how about this pipework light fitting? 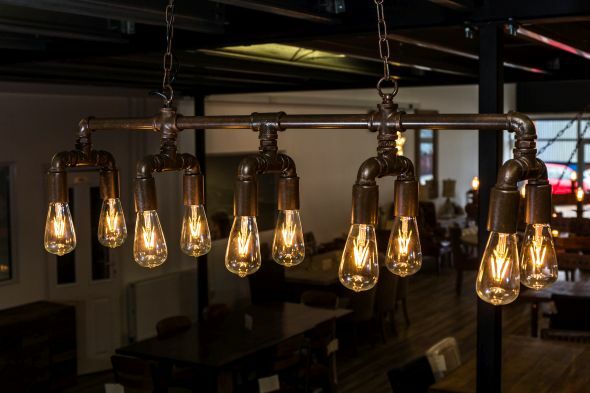 It’s ideal for any industrially styled interior!